Q: WHAT HAPPENS DURING A SERVICE?.. A: The service takes place in the convenience of your home at a time that suits you. 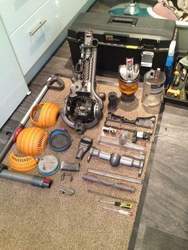 It generally takes about 45 minutes during which your Dyson will be stripped down to the motor cleaning all internal parts, carry out a comprehensive 52 point check, break down the cyclone assembly clearing all blockages. As it is rebuilt all parts are checked and analysed to ensure they are in good order i.e seals, cables, filters, hoses. If new parts are required then they can be supplied at an additional cost.